EV Central. PHEV Sales. The Volkswagen Golf GTE may be precisely what the market needs. The Volkswagen Golf GTE is exactly what I was hoping for; an affordable, performance-oriented plug-in hybrid that lets you go fast without the gas-guzzling guilt. With a combined 258 ft-lbs of torque and a top speed higher than the Tesla Model S, this little hybrid Golf promises to be big fun without sucking down a whole lotta gas. Just as speculation suggested, the Volkswagen Golf GTE gets a 1.4 liter turbo engine good for 148 horsepower mated to an electric motor at the front wheels with a maximum output of 101 horsepower. Combined output of both drivetrains is 201 horsepower, with 258 lovely ft-lbs of torque. Just as important though, the Golf GTE can go up to 31 miles on electric power only, up to a maximum speed of 81 MPH. That gives the Golf GTE the equivalent of 157 MPG, though real-world numbers are likely to be a lot lower. Still, as the Chevy Volt proved, if your commute is amicable to plug-in hybrids, you can go literally thousands of miles on just a few drops of fuel… and the GTE promises to get you there quickly as well, with the shifting handled by a dual-clutch six-speed slushbox. The Golf GTE can go from 0 to 60 MPH in 7.6 seconds, only about a second slower than Volkswagen’s own version of the hot hatch, the Golf GTI. It can also achieve a top speed of 135 MPH given the space, a full 10 MPH more than the standard Tesla Model S (top speed, 133 MPH). It’s the latest addition to the Golf GT line that also includes the much-coveted Golf GTD turbodiesel. The only real problem as far as I can see it? Volkswagen has no plans to bring this awesome car to America, instead giving us an electric e-Golf model to hold us over. Whomp whomp whommmmp. This article, Introducing The Peppy Volkswagen Golf GTE Plug-In Hybrid, is syndicated from Clean Technica and is posted here with permission. EV Central. EV Sales. The VW Golf is the most-sold European car in history, and now there’s an electric version of it – the VW e-Golf. The VW Golf is the most-sold European car in history, and now there’s an electric version of it. The VW e-Golf, unveiled at the LA Auto Show in November, has just been made commercially available in Germany. The starting price is €34,900 (~$47,800). That comes with an 8-year / 160,000-kilometer (99,419-mile) battery warranty. That’s almost exactly the same price as the BMW i3. Assuming Volkswagen is serious about selling this car, it could do well, but I’d be surprised to see its sales compare to sales of the BMW i3 or the much-lower-priced Nissan Leaf, Renault Zoe, or German-market-leading Smart Electric Drive. The e-Golf features low power consumption of 12.7 kWh/100 km (the frugal e-up! offers power consumption of 11.7 kWh/100 km). As a comparison, the Nissan LEAF consumes 15 kWh/100 km (in accordance with UN/ECE Regulation 101). 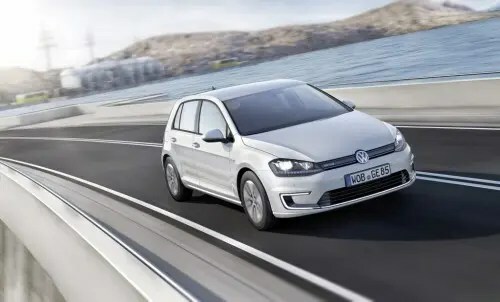 The e-Golf’s electric motor delivers 85 kW / 115 PS and from a standing start develops maximum torque of 270 N·m (199 lb-ft). The high-performance 12,000-rpm motor and the single-speed EQ270 transmission form a compact unit: the EQ270 also incorporates an integrated differential and an electro-mechanical parking brake. The motor and transmission was developed in-house and is made at Volkswagen’s components plant in Kassel, Germany. The e-Golf reaches a speed of 60 km/h within 4.2 seconds and 100 km/h after 10.4 seconds. The Golf A7 was developed from the outset to be a battery electric vehicle. As the Modular Transverse Matrix (MQB) architecture that underpins the new Golf A7 is so flexible, Volkswagen was able to integrate the lithium-ion battery in a space-saving frame in the vehicle floor, under the front and rear seats and in the center tunnel. Like the electric motor and the transmission, the battery was also developed in-house at Volkswagen and is made at the company’s facility in Braunschweig, Germany. The liquid-cooled lithium-ion battery accounts for 701 pounds (318 kg) of the e-Golf model’s 3,090-pound (1,402 kg) curb weight. It comprises 264 individual prismatic cells, which are integrated into 27 modules (each with six or twelve cells). Collectively, the cells have a nominal rating of 323 volts, with an overall capacity of 24.2 kWh. Depending on the nature of the route, driving style and load, the range is between 130 and 190 kilometers. More specifically, Volkswagen says, under the NEDC cycle, the range is 190 km. Practical range according to Volkswagen is the 130-190 km spread; and in winter operation, the range is expected to be 80-120 km. Volkswagen seems to have gotten serious about electric vehicles after Martin Winterkorn took over as CEO in 2007. Nonetheless, it has taken the German auto giant a while to get into the game. Jumping into the market just within the past 6 months, it now has two high-volume cars available at competitive process and with unique features. Statements from some board members also makes it seem that the company is serious about an electric vehicle transition. 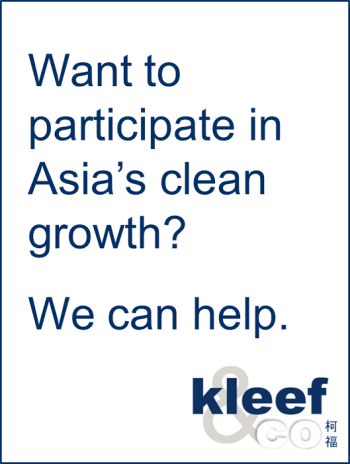 Notably, in less than one month the company will be highlighting its new electric mobility options via public events that even include music concerts. Under the slogan “electrified“, Volkswagen will be launching a series of e-mobility weeks in March on the site of Berlin’s former Tempelhof Airport. Volkswagen will offer a comprehensive overview of Volkswagen capabilities in the field of electrically powered motoring. From 14-16 March, members of the public can avail themselves of the numerous facilities on offer, such as test driving vehicles. The e-mobility weeks will be rounded off with public concerts in the evening. Whether by force (European requirements) or choice, it’s nice to see Volkswagen finally jumping into this. Let us know if you happen to have had any experience with the VW e-Golf yet! This article, VW e-Golf Now Available In Germany — Price = €34,900, is syndicated from EV Obsession and is posted here with permission. EV Sales, Germany, VolkswagenElectric car, electric car sales, electric vehicle (EV), EV sales, Germany, volkswagen, vw, VW e Golf, VW e-Up! Recently, it was announced that there will be a gas-electric plug-in hybrid version coming soon. Called the GTE, it will have two engines. The gas-powered engine will be 1.4 liters, will be turbo-charged, and will have direct injection. Also, a 107 hp electric motor will be paired with a 8.8 kwh lithium-ion battery. The cost isn’t known yet, but the folks at Inside EVs said it might be in the low to mid $30,000s, a bit higher than we heard in November. AutoWeek test drove a prototype and said it got almost 60 mpg. The GTE might be an effective head-to-head competitor with the Toyota Prius Plug-in, especially with its sportier appeal. Its sibling, the GTI, has been known to be both quick and nimble, so the GTE might inherit some of these same characteristics. The Prius seems to be more of a typical sedate, but efficient commuter vehicle. Another hybrid competitor in the same price range is the Chevy Volt, which may not be as quick or as athletic in its handling as the forthcoming GTE, so the GTE might do well competing against the Volt as well. This article, VW Golf Plug-in Hybrid Coming Soon, is syndicated from Clean Technica and is posted here with permission.